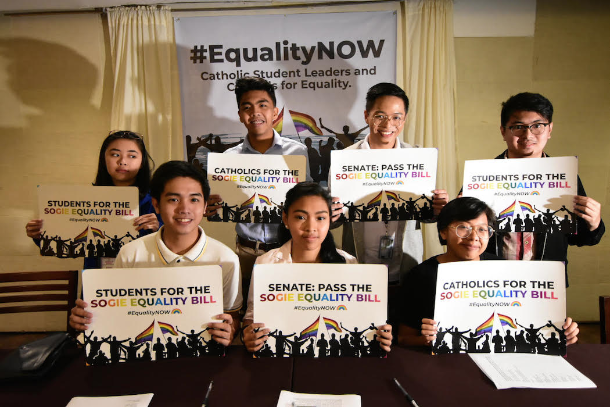 Support for the passage of a bill designed to end discrimination on the basis of gender and sexuality in the Philippines has gained support from student leaders at Catholic schools in the country. Senators have also expressed support for the proposed Sexual Orientation and Gender Identity and Expression Equality bill in Congress. Student councils of several Catholic schools are also supporting the proposed law, which prohibits discrimination on the basis of a person's sexual orientation. Ignoring possible sanctions from their schools, student councils from seven Catholic schools in Manila released a joint statement on Aug. 10 expressing support for the proposed measure. The students called on legislators to move for the bill's approval, saying that "brought up on the Christian values of love and acceptance ... we must forge a society grounded on equality." The Lower House of Congress has already passed its version of the proposed measure but debated the bill a record 26 times. "Every day with discrimination, people of diverse [sexual orientation and gender identity] get thrown out of their schools and homes, outed and ridiculed in the streets, barred from full employment and deprived of access to healthcare," read the students' statement. The student councils of the Jesuit-run Ateneo de Manila, the Dominican University of Santo Tomas, San Beda University, De La Salle University, Miriam College, St. Scholastica's College and the College of St. Benilde cited their "Christian upbringing" in pressing for the passage of the measure. The bill was sponsored by Senator Risa Hontiveros on Dec. 14, 2016, but has faced an uphill battle in the Senate. Senator Loren Legarda, who supports the proposed measure, said it would be a "great legacy" of the Senate "if we are able to pass the anti-discrimination measure during our watch." "The state should protect the rights of all its citizens, which include members of the [lesbians, gays, bisexual, transgender] community," said Legarda, adding that no person should be discriminated on the basis of sexual orientation and gender identity or expression. The Catholic bishops' conference issued a statement supporting a proposed anti-discrimination law back in 2015. The bishops, however, made it clear that they do not encourage choosing one's gender or performing homosexual acts, among other things. The prelates said an anti-discrimination law is a "gesture of charity" if discrimination means that certain individuals, because of sexual orientation or gender identity, are systematically denied fundamental human rights. 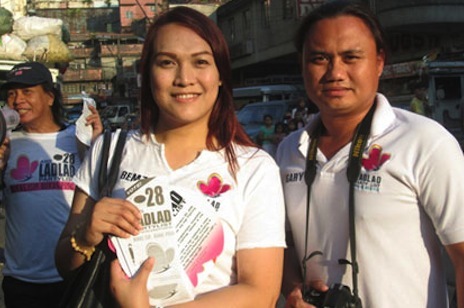 World's first party to win on a gay agenda - in the Philippines?